My name is David Sanipass. 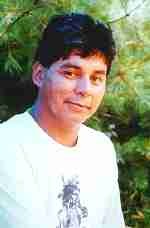 I am Miqmaq (today known as Micmac). I have been making and playing Native American Style flutes for about 30 years. My Grandfather taught me how to carve flutes at the age of nine. As a child, I would sit with him for hours to watch and ask questions about the art of flute carving. 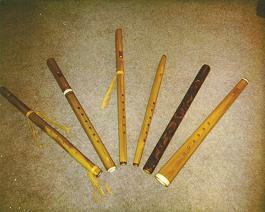 It can take from 5 to 20 hours to carve a flute. I harvest all the wood and make many of the tools myself. I do not use any power machinery. I use mostly lightning struck white cedar. Once the cedar tree is struck by lightning, the wood crystalizes. It is this result that gives the finished flute a unique sound and tone. 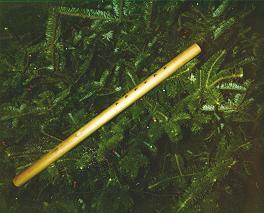 I also make a "sweetgrass" flute (displayed here). This is traditionally a Grandmother's or woman's flute. While this flute is played, the player as well as the listener is soothed by the light fragrance of "sweetgrass" with each note.